Shopping and Your Credit Utilization And while you should keep an eye on your budget as you shop, you should also think about the effect spending may have on your credit health and credit cards. MintLife Blog > Credit Info > Know this Rate. Holiday Shop with More Credit Confidence. Know this Rate. Holiday Shop with More Credit Confidence. The holiday shopping season is upon us. Whether you have big gift-giving plans or just want to get a few presents for your closest loved ones, it’s the time of year spending may be a little higher than usual. And while you should keep an eye on your budget as you shop, you should also think about the effect extra spending may have on your credit health, especially when it comes to credit cards. One important concept to know? Your utilization rate. First things first: credit card debt is revolving debt. There are two basic kinds of debt: installment debt and revolving debt. With installment debt, the borrower usually gets a relatively large amount of money, up-front, which they then have to pay back in “installments,” usually spread-out, equal monthly payments. Think of this kind of debt as what you might owe on a mortgage or student loans. Revolving debt, on the other hand, typically involves some sort of line of credit you can use as much as you’d like up to a maximum per period. This is usually how credit cards work — when you’re approved for a card, you’ll have a specific, monthly credit limit you’re not supposed to exceed. When you pay your monthly bill back, you can either carry a balance (making sure to at least pay the minimum monthly amount), pay the entire amount due, or whatever you can (or choose) to pay in between. Credit card use and credit scores. There are several different types of credit scores based on all kinds of different information. Usually, though, consumer credit scores are calculated based on a few common categories, including: on-time payments made, number of accounts opened, how long accounts have been open, whether you’ve missed payments or had accounts sent to collections, and most importantly for our purposes…utilization rate. What is a utilization rate and how is it calculated? Utilization rate (sometimes called utilization ratio), very simply, is the amount of your available credit you’re currently using for revolving accounts like credit cards. The utilization rate is usually expressed as a percentage. The utilization rate can actually be calculated in two different ways. Let’s say you have two cards: For Card 1, you have a balance of $1,000 and a credit limit of $10,000. For Card 2, you have a balance of $4,000 and a credit limit of $5,000. So, when we add up the balances, we get $5,000 ($1,000 + $4,000). Adding up the credit limits gets us $15,000 ($10,000 + $5,000). So, the utilization rate is $5,000 / $15,000 or approximately 33%. You can also calculate the utilization rate by averaging the utilization rates for each card. Using the previous example, Card 1’s utilization rate would be: 10% ($1,000 / $10,000). Card 2’s utilization rate would be 80% ($4,000 / $5,000). Those average out to 45%. As you can see, the same exact spending on the same exact cards can look very different depending on how you calculate the utilization rate. 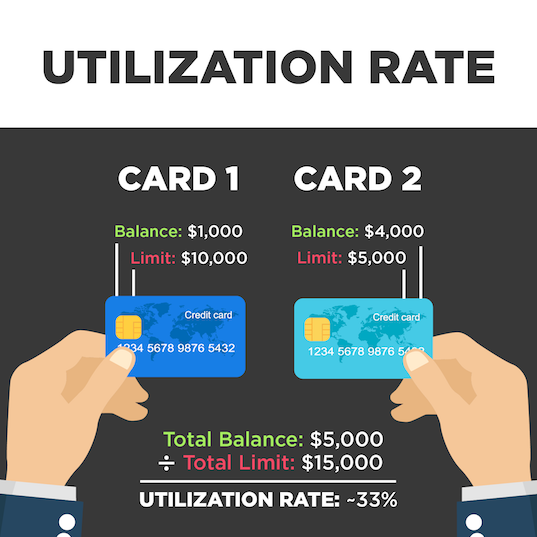 It’s not too important to dwell on how the utilization rate is calculated, but you should know that some calculations may be more encouraging than others of spreading out your spending across several different cards. Why is the utilization rate important and what’s a good one? So, why might the utilization rate be something credit scores would want to factor in? Because a higher utilization rate may be a sign the borrower is going to have trouble paying the debt back. That means when it comes to your credit health, it’s usually the case that the lower your utilization rate, the better. Okay, but how low? This is a tricky question because each credit score, if it even takes utilization rate into account, may view it in a different way. Generally, though, keeping each card’s utilization rate under 30% is a good start and under 20% may be even better. Is spending the only way I can affect my utilization rate? Not exactly. One possibly lesser-known way to keep your utilization rate low is to increase your credit limits. If your spending stays the same and your credit limit increases, the spending will be a lower percentage of your credit limit as a result. If you do choose to request a higher credit limit on a card, just know that the request may involve a hard inquiry, which in turn, may have a negative effect on your credit health. You should also be careful that increasing your credit limit doesn’t encourage you to spend more than you otherwise would. Credit may be the last thing on your mind as you’re browsing sites for deals or combing the aisles for bargains this holiday shopping season. But by knowing how your utilization rate works, you’ll have a better idea of how your credit card spending may be affecting your credit standing. After all, why shouldn’t your credit health also be a part of a happy, healthy holiday season?